A photo and police sketch have been released for the suspect of a robbery that took place in Mississauga. The incident occurred at 6:05 p.m. on March 28, 2017 in the area of Ambler Drive and Kamato Road, north of Tomken. The suspect, allegedly armed with a handgun, met with a female victim and tried to rob her. Police say a struggle ensued between the suspect and the victim, causing a single bullet to be discharged and become lodged in a door. The suspect fled the area by unknown means, police say. The victim was uninjured. The suspect is described as a dark brown male, thought to be either Guyanese or mixed race, between 24 and 30 years old. He is 5'10" tall and 160-170 lbs with a medium build, black wavy hair, and dark eyes. 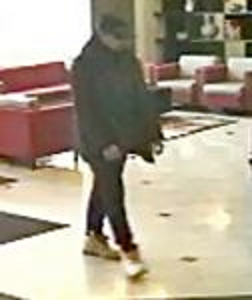 He was wearing dark pants, a black zip up hoodie or jacket, a camouflage-coloured hunting vest, and tan-coloured boots. The suspect may go by the name "Frank Whyte" and may frequent the area of Trethewey Drive area in Toronto, according to police. Anyone with information regarding the suspect or this incident is asked to contact police at (905) 453-2121 ext. 3410.